As we support Youngest in her transition to university, I’m reminded of how vitally important are all those skills that aren’t only academic, especially the skills of time management. In my own undergraduate days, I wasn’t a paragon of time management prowess. Many essays were typed the Sunday before they were due only by virtue of the fact that it took most of a day to go from handwritten notes on legal pads and a towering stack of books beside my table to typewritten essay. I kept well ahead of readings mostly because I love reading but I lacked the savvy to read efficiently so that the only thing that saved me was my ability to speed-read. I never pulled all-nighters, but I stayed up too late too many times doing too much stuff at the last minute. In short, I wasn’t good at time management but I learned through the school of hard knocks. I’ve tried to teach time management to my students in university – not as a broad set of academic principles, but in practical requirements for the course that force students to try out some time management principles by scaffolding assignments with proposals, submitting drafts or discussing their progress on a regular basis. I’ve become convinced of the value of planning work ahead, even to the point of assigning myself fictitious due dates (a few weeks or a month ahead of what’s required) to ensure that I’m not, myself, working up against an impossible deadline. Estimate how much time each activity will take – 30 minutes/problem for these questions; 3 hours for this reading, etc. We’ll see how this goes. So far today she’s done two parts of one big assignment and read through a textbook chapter. I’m off to remind her now that the first two books of The Odyssey (another part of today’s goal) still await before I take a moment to write down and organize my own week’s activities because I’m realizing this level of planning can work for me as well as for her! Want more time management material? York U’s excellent Time Management Guide and Many Time Management Resources & Links at Dartmouth. Enjoy! It’s time for me to get back to class prep. That’s in my schedule, you see! After a long time working on other projects, I’m happy to be getting back into my research on early modern families and crime. The university approved my work-study application so that, starting this fall, I’ll have a student working with me to analyze Old Bailey sexual offence reports exploring how family members were invoked and involved. This should be rewarding for both of us – I’m hoping we can aim for some publishable results at the end, as co-authors. This project should also help me to focus my research and writing time on revising another family & crime history article that’s been sitting on the back burner for several years now. Right now my focus is on preparing the way for our study – putting together the bibliographic framework, assessing how the rise of self-censorship within The Proceedings will affect the scope and analysis, etc. I don’t want to overwhelm the student or myself. The dangerous thing with a wide-open research scope is the being buried in too much material. So we’ll start small and see how far we go. Still, it’s pretty exciting. Being on faculty at a regional university means that I’m used to being the only one working on X, Y or Z. Even my graduate students have tended to work far afield from my own research subjects but this work study project will hopefully employ a student who’s equally interested in the material and aspects of the topic so we both can profit by the connection! 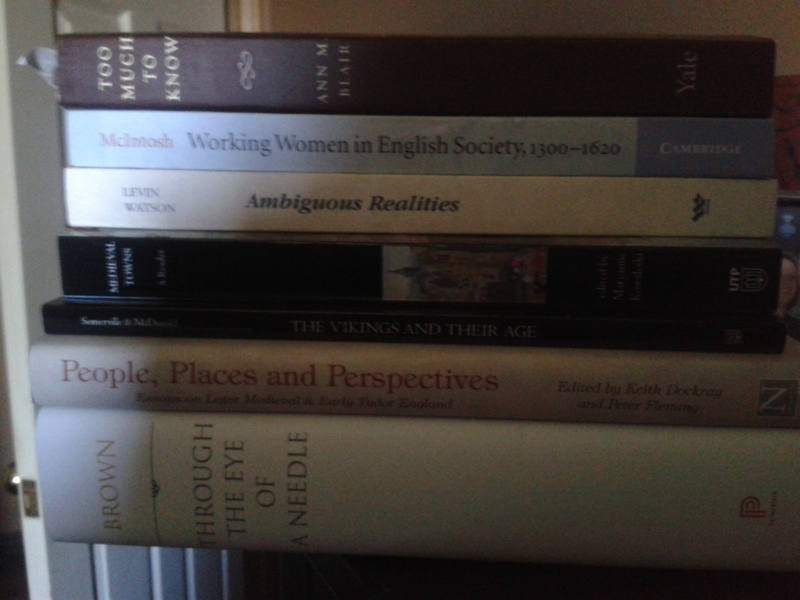 If you want to know what’s been consuming my life for much of the past month (besides mountains of marking, a conference presentations and many other responsibilities) it’s Women’s HIstory Week. Twenty-two years and counting, this event has been a feature on our campus. So what are you waiting for? Join us on campus and downtown for Women’s History Week 2015 at Laurentian University / semaine de l’histoire des femmes 2015. Click either link for the full schedule of events. We have open classrooms all week long, a book launch and a keynote lecture by Dr. Jane Nicholas of St. Jerome’s University and author of The Modern Girl, who will speak on “Why the Flapper Matters: T he Canadian Modern Girl” Thursday night, 7pm at the Speakeasy downtown. How perfectly appropriate is that for a venue? I’m also excited about the open classrooms initiative that is a long-time feature of our event. There are faculty participants from Communications, Environmental Studies, History, English, Ancient Studies and more who have agreed to open their classrooms to the wider public this week. Fellow students, staff members and other profs might just pop on in as well as any one interested in seeing how the subject of women is taught across disciplines at Laurentian. The book launch celebrates the recent biography of Madge Watt, founder of the Women’s Institutes, published by our own Dr. Linda Ambrose who brought Women’s History Week into being as well as nurturing students and scholarship in the field over the past twenty-two years. 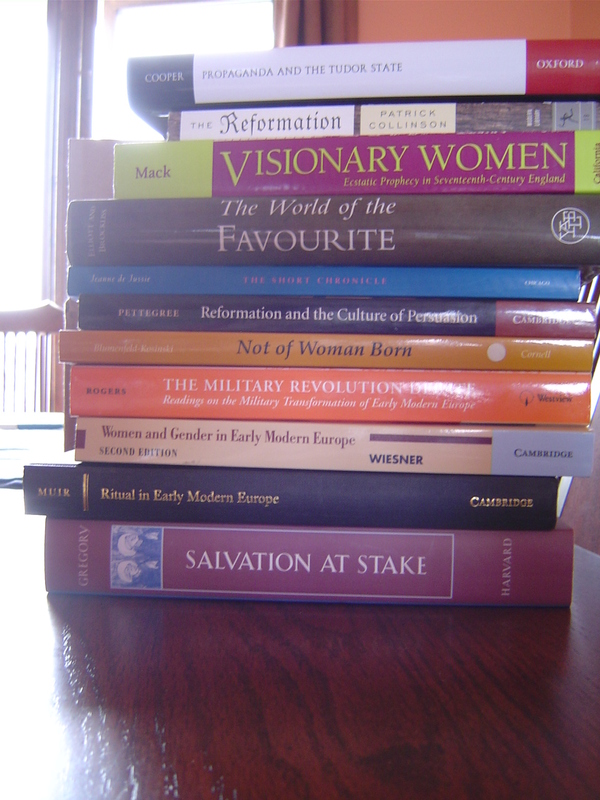 Comments Off on Women’s History Week 2015! Wednesday we’re back into the routine with three courses on tap for me this fall: Western Civilization (Renaissance to French Revolution), Early Medieval Europe and a graduate seminar on London history. Al told, I think I’m squeaking in with just under a hundred students in the three courses: still the most of any one faculty member in our program. Go me? I’m really excited about all three classes but particularly happy with the prospect of this year’s go in Western Civ. The subject is something I’ve taught almost every year since starting but it’s a course that constantly renews itself given the hundreds of years of history and historical studies I draw upon. This year I’m doing something unusual for myself – I’m teaching with all three of the same texts as last year: two general survey narratives that cover our period from 1350-1815 and one primary source work, The Lusiads. Normally I swap out primary source texts every year to keep teaching fresh (and to minimize the chance of plagiarism). But The Lusiads was such a fun work to teach and had so many intriguing aspects to it that last year’s class had only begun to explore, I felt compelled to give it another turn. The Lusiads is Portugal’s great national epic and a conscious throwback to Virgil’s great Roman poem, The Aeneid. Yet it’s also very contemporary for the sixteenth century in which it was written: telling the tale of Vasco da Gama’s circumnavigation of Africa and travels to India. The epic poem, ably translated into modern verse by Landeg White, has just about everything you could want to touch on in an introduction to European history for the period: there are themes that draw on Renaissance conceits (classical gods, learned allusion), elements of religious conflicts (Christian divisions and prejudice towards other religions), the broad sweep of exploration, discovery and exploration in da Gama’s voyages, and all brought together with innovations in technology, worldviews and social orders. Relatively little-studied in the anglophone world, I found that teaching with this text was a great refresher for the course which might otherwise feel ‘stale’ and I can’t wait to tackle it again with a better sense of the pitfalls and promises inherent in such an unusual text! You’ve seen the story making the rounds amongst parents and academics that correlates helicopter parenting with college-age depression. You might well have nodded along as you read the horrific stories of awful parents who dictate their kids’ university choice, major and even study habits. These are truly wrong-headed individuals who, by micro-managing their children’s lives well into adulthood, deprive them of the chance to learn how to be independent, self-reliant and find their own happiness. That said, I take issue with a big part of the article’s claims. The emphasis is that of Julie Lythcott-Haims, author of the book from which the article is an excerpt. The former freshman dean at Stanford candidly admits that she knows this overactive parenting culture all too well and frequently has fallen into some of the bad habits she herein decries. I’m good with anything that helps to counter the scourge of parents who treat twenty-somethings as toddlers or leads to mom or dad buttonholing profs and TAs over what’s properly the student’s turf. And don’t get me started on that smooth rhetorical slide right past the whole correlation line because we all know correlation is not causation, right? Right! In any case, I’m troubled by the easy equation of depression in college-aged people with the evils of helicopter parenting. Yes, that can be one factor, but is it the only or even the best? I’d say no. There’s a whole raft of reasons for the youth of today to be profoundly depressed. It’s the economy, stupid! We’re destroying the planet and waging war worldwide. Even if we focus in those problems directly affecting colleged-aged people who are actually going to college, there’s still enough fodder for a real-world dystopian Hunger Games: ruinous tuition increases, student debt that’s impossible to discharge, gutted support for students, dismal job prospects and political leaders enthusiastically dismantling public higher education. Oh, that’s cheerful, isn’t it? Let’s not forget how these young people have been hemmed in by decades of “No Child Left Behind” and other onerous testing regimes in their school lives, or communities that eagerly police the practices of “free-range” parenting. When students revolt against standardized tests, how are we surprised? But ignore that man behind the curtain, Dorothy. No, look at the bad parents here and there. Why, they’re the cause of this whole problem! Let’s just get them to change their behaviour and, sure as shooting, young, crestfallen folk across the continent will start to perk up. That’s ridiculous! This is a small fix for only a tiny slice of a big problem. But it’s easy, ridiculously easy, to stir up popular disgust with painful parenting practices such as those described in the story. Nobody can justify those excesses, but nobody can sustain the argument this helicopter parenting the key to the real mental health crises on university and college campuses or in those peer groups beyond the ivory tower. Depression is an illness but there are people who can help you. Depression is serious, depression is real and depression isn’t banished by condemning over-the-top parenting practices. We need to accept that helping young people manage their mental health takes resources, commitment and actually paying real attention to their concerns. So let’s stop feeling as if condemning one particular brand of bad parenting is what we need to do to support students with their mental health issues, okay? Thanks. As of July, I’ll be a Full Professor of History here at Laurentian University. I had applied last July 1st, even though I was barely back on my feet after a spring sacrificed to illness and malaise. I was ill but not so ill that I couldn’t wrangle the binder full of paperwork together for the promotion application. With four publications slated to appear in the next several months, I hoped that the application would be acceptable. It was a gamble. I definitely haven’t had the most conventional publishing career of any academic historian. But I enjoyed the support of many colleagues here and elsewhere, for which I’m grateful. I also realized that, even if I was turned down, how bad could it be? Staying as a associate professor until I could try again? Not a hardship. So there’ll be new business cards (if those are even still a thing) this summer and, more importantly, the opportunity to do more service, research and teaching secure that the only thing I have to prove to others is what’s there in my work.